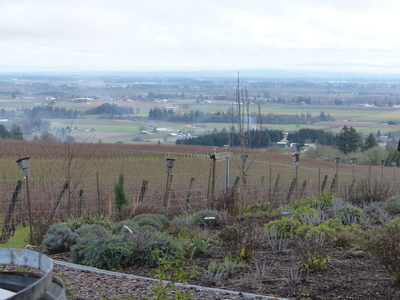 The winery grounds, vineyard, and the Willamette Valley beyond are all visible in this photograph taken during an oral history interview with Janie Brooks Heuck at Brooks Winery in Amity, Oregon on January 10, 2018. Brooks Heuck was interviewed by Linfield College archivist Rich Schmidt. Also in attendance was Linfield College student Tia Elder. Janie Brooks Heuck is managing director at Brooks Winery, founded in 1998 by her brother, Jimi Brooks, who subsequently passed away in 2004. Pascal Brooks, Jimi's son, is now the owner of Brooks Winery. Since 2002, the winery has been using biodynamic farming processes to make its wine, achieving certification from Demeter in 2012. Brooks Winery was featured in the 2014 documentary, American Wine Story. Linfield College Archives, "Janie Brooks Heuck Interview 10" (2018). Browse All Willamette Valley Oral History Interview Photos. Image. Submission 514.